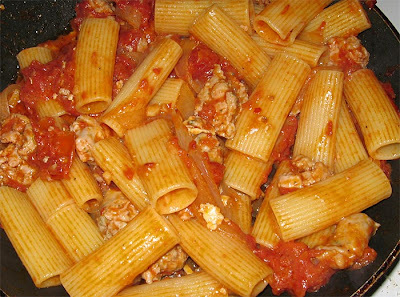 Pizza and pasta are so similar I occasionally use a typical pizza combination to influence my pasta, and vice versa. See my carbonara pizza for an example. So I had some sausage in my fridge, and thought of making a pasta that played off the typical sasuage and onion pizza you find in Italy - with a tweak that likely no Italian would make (although perhaps a French cook would). I julienned some onion (they are always julienned and not chopped on Italian pizzas), sauteed it with garlic, then added tomato, a lot of red pepper flakes, black pepper, and the sausage (sweet Italian pork from the Whole Foods butcher). Pretty standard stuff. Inspiration struck, and I added about a tablespoon of St. André cheese (the soft French stuff) to the sautee and let it melt and disappear into the sauce. This all went onto some rigatoni and topped with parmigiano reggiano. The result was fantastic. Had a good deal of spice from the pepper and garlic, the sausage sweetened the sauce, and the St. André added a slight background creaminess along with just a hint of its brine and funk. Think of it as a more interesting option to simple cream, an ingredient I tend to hate in pasta as it drowns out flavors. The idea is to add just enough to get a touch of creaminess but not enough that it or the cheese flavor stands out on its own. Here's a pic. The misshappen chunks of sausage don't look appealing I know, but the taste was heaven.